Now We Are Six (1927) and The House at Pooh Corner (1928) in the next two years, having already published When We Were Very Young in 1924. To me, the reason Winnie is still in our hearts is because of his wonderful friendship group. I’m sure I’ve read somewhere that in any group of friends you’ll find all the characters found in Milne’s stories. Have a think about your friends, do you have a whimsical Winnie, a skittish Piglet, a dreary donkey, a rushing Rabbit, a careful Kanga and a tumultuous Tigger? Which one are you? All the friends jog along playing out beautifully whimsical stories (Milne was accused in his lifetime of being too whimsical. I wonder, are his accusers still being read by new generations?) which we can still imagine in our futuristic, from Milne’s point-of-view, 21st century world. You can probably divide our generation into those who read Winnie-The-Pooh as a child and continue to love him, and those who never read the stories and wonder what all the fuss is about. Oh, they are missing out! Henry Ward Beecher said “It is a man’s duty to have books. A library is not a luxury, but one of the necessaries of life” and surely that library must include the Winnie-The-Pooh stories. I’ve kept my Winnie-The-Pooh book from my childhood, and have added another copy of it now that I have my own children, along with The House at Pooh Corner. There are lots of extra books now, including The Pooh Dictionary, also on my shelf, including such words as Eeyorish. One thing that has always bothered me about the very first story is why wasn’t Pooh invited to Piglet’s party? Christopher Robin was there, so was one of Rabbit’s relations (“Well, it just so happened that you had been to a party the day before at the house of your friend Piglet … and one of Rabbit’s relations had had a big blue balloon”). Why wasn’t Pooh there? Where was he? I like to imagine that there is another story about that somewhere: Chapter One and a Half in which Pooh takes a Tumble and Doesn’t Get to Piglet’s Party. 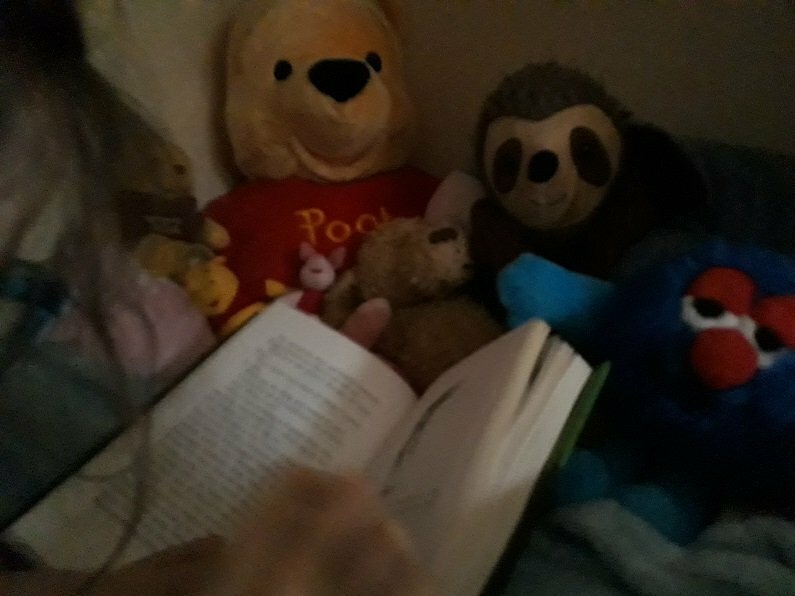 When my daughter first read the stories, she spotted something that will no doubt continue to trouble her: “Chapter Four in which Eeyore Loses a Tail and Pooh Finds One”. My daughter pointed out to me that this implies Eeyore has more than one tail. In conclusion, I love Winnie-The-Pooh and all that us new authors can do is read and know the great stories that came before us and do our best to honour them with our own children’s story book characters who will live on (hopefully) after we’ve gone.